The Breckland parish of South Lopham is situated on the Norfolk/Suffolk border, west of Bressingham and south of North Lopham. Its name comes from the Old English for ‘Loppa’s homestead’. The parish has a long history, and was certainly well established by the time of the Norman Conquest, its population, land ownership and productive resources being detailed in the Domesday Book of 1086. 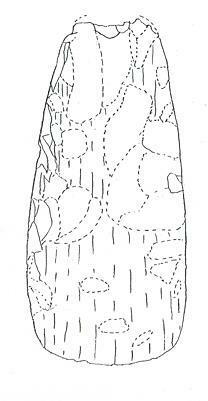 The earliest evidence of human activity comes in the form of a Mesolithic flint tool of unspecified type (NHER 11497), found in 1938. More precisely identifiable finds are three Neolithic polished flint axeheads (NHER 10867, 10868 and 34511) and one of polished jadeite (NHER 10919). Bronze Age objects recovered to date are two copper alloy awls (NHER 29679 and 31339). So far, the only Iron Age object is a brooch (NHER 31337). No traces have yet been found of Roman buildings, but quite a number of Roman objects have been recovered, including coins (NHER 10872, 24825, 24826, 29679 and 37180), brooches (NHER 30356 and 30934), pottery fragments (NHER 24835) and a copper alloy figurine of Mercury (NHER 29680). Saxon finds are brooches (NHER 31277 and 31336), two pennies (NHER 31333 and 31335), a strap end (NHER 31334) and a sword hilt mount (NHER 37181). 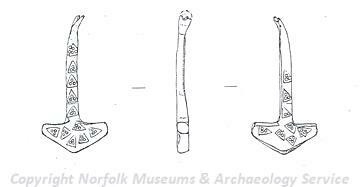 Metal detecting in 1994 recovered a Late Saxon decorated gold alloy Thor's hammer pendant (NHER 31413). Thor's hammers, the symbol of the god Thor in Norse mythology, were worn as amulets by Vikings of pagan belief to invoke his protection. The Saxon and medieval periods have left the parish with its oldest surviving building, St Andrew’s Church (NHER 10873). The nave of this building has Late Saxon origins, as can be seen from the round Saxon window in the north wall. Then came the Normans, and what stands out, brooding over the landscape, is the superb Norman central tower, dating to about 1120 and the most powerful example of any parish church in the county. The battlemented parapet with central gargoyles was added in the 15th century. The south aisle and chancel date to the 14th century and the south porch probably to the 15th, the whole church later being subject to an enthusiastic Victorian restoration. Inside, despite the restoration, there is much evidence of earlier work, including fine 15th century roofs and late medieval carved bench ends, one of them of an elephant, rather erratically portrayed as having a long beak instead of a trunk. It also has hooves. Beneath the enormous and splendid west window is a 14th century octagonal font with a delicately carved bowl and stem and a 17th century cover. Nearby is a large rough-hewn chest, said to be as old as the tower. Other medieval buildings have not survived, but have left a footprint in the form of their surrounding moat. East of The Old Rectory are the remains of a moated site (NHER 10882). The north, east and south ditches can still be seen under trees. Documentary sources say that a pond east of Hall Farm was the site of a medieval moated manor house (NHER 15786). Though the identification is fairly certain, nothing in the current layout suggests the moat's presence. Quite a number of medieval objects have been recovered, including coins (NHER 30746 and 31338), buckles (NHER 30356 and 31338), pottery fragments (NHER 24835 and 37180), a seal and tokens (NHER 24826), a pilgrim badge (NHER 30357) and bottle (NHER 37180), a harness pendant (NHER 31340) and a key (NHER 31339). Of the post medieval buildings to survive, the earliest have 16th century origins. Primrose Farm (NHER 29816) on Primrose Lane is an important recent discovery of a 16th century timber framed building disguised behind a 19th century brick front. The gable end retains a perfectly preserved two bay shop window with arched heads and an arched doorway. The first floor is jettied over the shop window. The rear cell appears to have housed a small industry of some kind, the ceiling timbers being smoke-blackened, and presumably the shop sold what was manufactured round the back. The construction is of high quality. The building was turned into a dwelling in the 17th century, when the chimney stack was inserted and a bay added to the north end. In the late 17th century the timber framed barn was erected. Both buildings have now been restored. Also 16th century are Walnut Tree Farmhouse (NHER 20150), Driftway Farm (NHER 25801), and Oxfootstone Farm (NHER 20152) on Brick Kiln Lane, which has in its modern conservatory the Oxfoot Stone (NHER 10907) from which the house takes its name. Pearce’s Farm (NHER 16623), Noddle Farmhouse (NHER 20151), Willow Tree Cottage (NHER 46223), Corner Farm (NHER 46768), Oak Tree Farmhouse (NHER 46545) and the White Horse Public House (NHER 46224) on The Street all have 17th century origins, as does the barn (NHER 46403) immediately west of Primrose Farmhouse. Fen Farmhouse (NHER 31732) dates from about 1700. Chequers Farmhouse (NHER 46221), 1 and 2 The Street (NHER 46714), 4 and 5 The Street (NHER 46546), Brook House (NHER 32586) and the pair of houses (NHER 46222) south of Oxfootstone Farmhouse (NHER 20152) are all 18th century and later. Hall Farm (NHER 29803) on Church Road was once described as a superb example of a typical large late 19th century farmstead. It consisted of three cart horse stables with yards and shelter sheds, two bullock yards, cow byres and yard, piggeries with boiling houses, and a barn in an unusual position but suitable for the use of steam engines. All the buildings were derelict by 2005 but are understood to be under conversion and renovation. Other post medieval buildings have not survived. Two windmills once stood in the parish; one (NHER 15309) is marked on a map of 1797 south of Mill House, the other (NHER 16414) is marked on a map of 1836 west of Redgrave Road. The most historically recent entry on the record is a type K6 square glazed cast iron telephone box (NHER 46401) at the junction with Primrose Lane. It has a domed roof and was built to a 1935 design by Sir Giles Gilbert Scott. P. Aldridge (NLA), 8 October 2007.